I’ve been unusually quiet on the blog front – but something has been brewing. 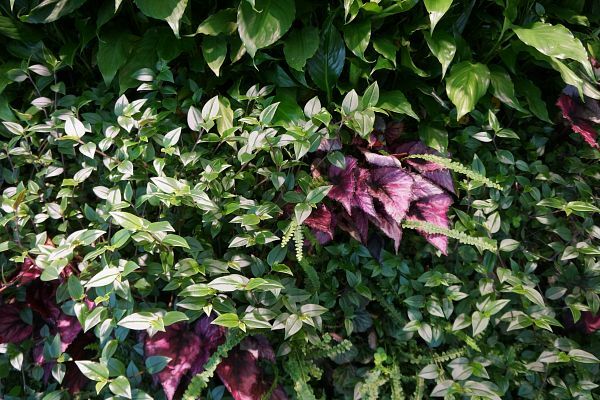 I’ve been preparing a new green walling company – Vertology (the art of/science of vertical green-ing). I’ve done this to build on my experience gained from the company I conceived and co-founded, Biotecture, back in 2007, and my time since then working internationally as a designer. 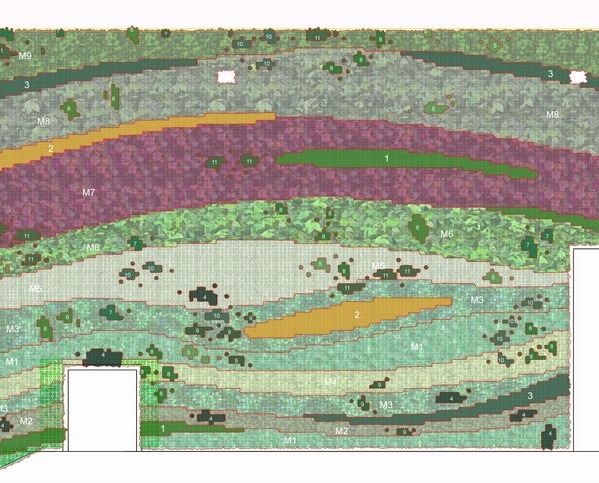 Vertology aims to take greening up to the next level, to increase expertise, plant knowledge, systems design and affordability. A tall order, but it is there to do! 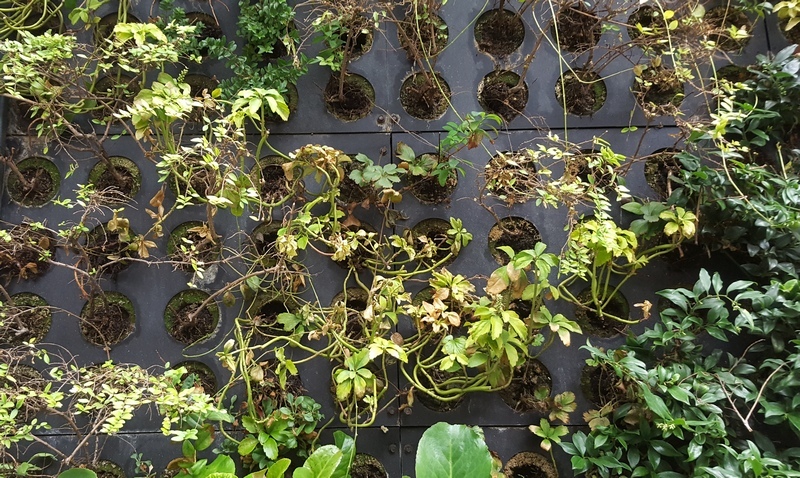 Vertology will make its debut at the Chelsea Flower Show where it is providing six green walls for the RNIB fresh garden, sponsored by Countryside Properties and witht he garden designed by LDC. I’ve never seen so much intensive design in a small space! Can’t wait to see it finished. 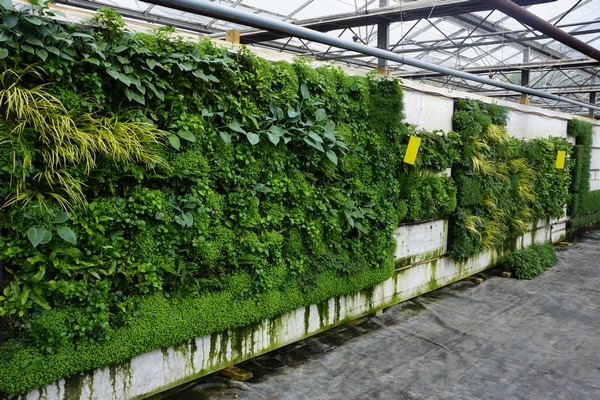 Here are the walls growing in the Vertology greenhouse. 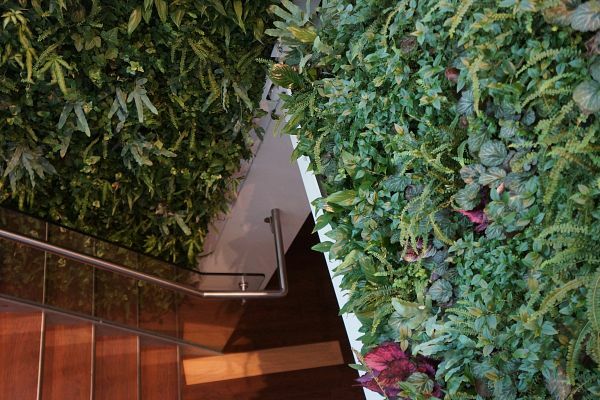 I recently visited newly installed walls at Wilson Street, London, which I designed for Biotecture.These were a joy to behold with lush new growth on the two main walls on the ground floor reception, and later walls to basement areas which were designed and planted up slightly later. 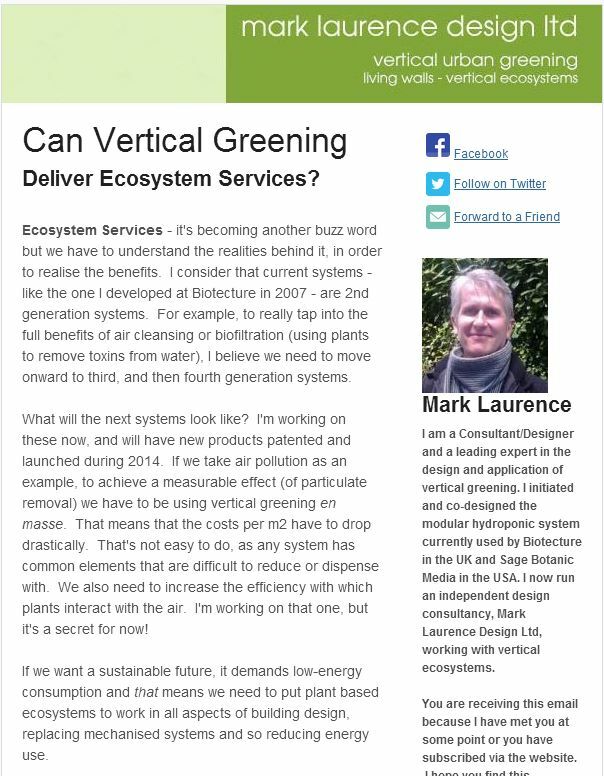 I launched my newsletter this week on vertical greening, sending it out to clients and those who’d signed up here or on the website. From the number of views and feedback, (considerably higher than industry standards) I’d say it was a success! 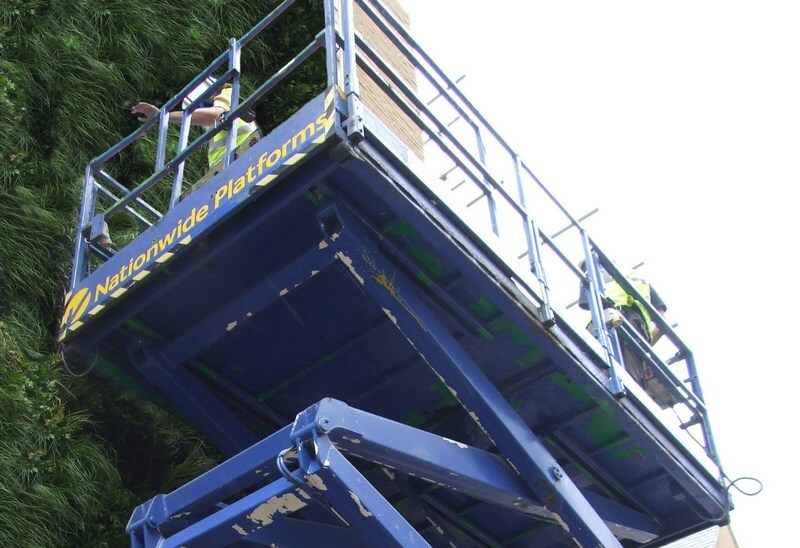 The aim is to inform interested parties of news and developments in the field of vertical greening. Don’t miss the next issue – sign up using the form on the right! 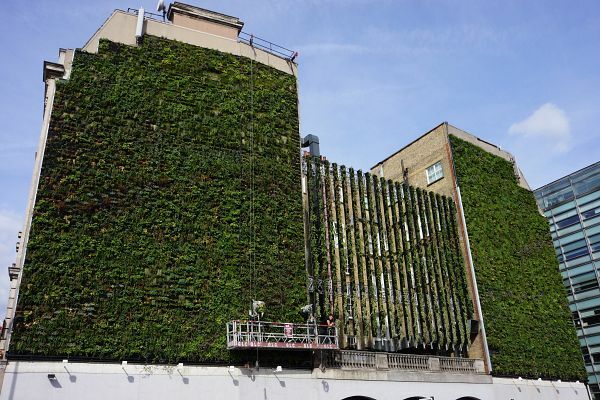 A new wall has just been installed at the Aveda Institute at High Holborn. An unusual design, it is a column wrap-around, which gives some design and technical challenges. Because it was not possible to retrofit drainage into the building (a common problem when buildings are not owned by the occupiers), a recurculating, tank-based system was designed. 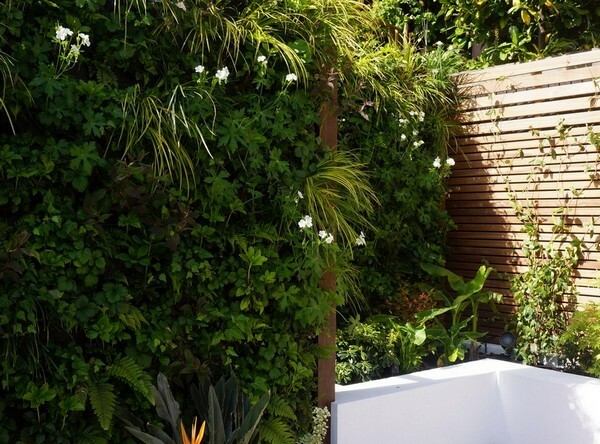 Normally, water is not recirculated in a green wall because the addition of nutrients (usually injected into the water-flow) would cause a build-up of excess mineral salts and create chemical burn to the foliage. 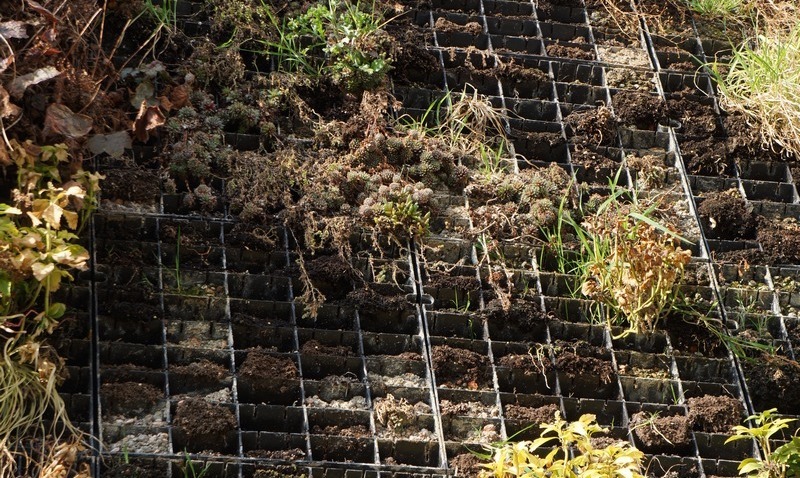 This system avoids those problems and solves the drainage issue. 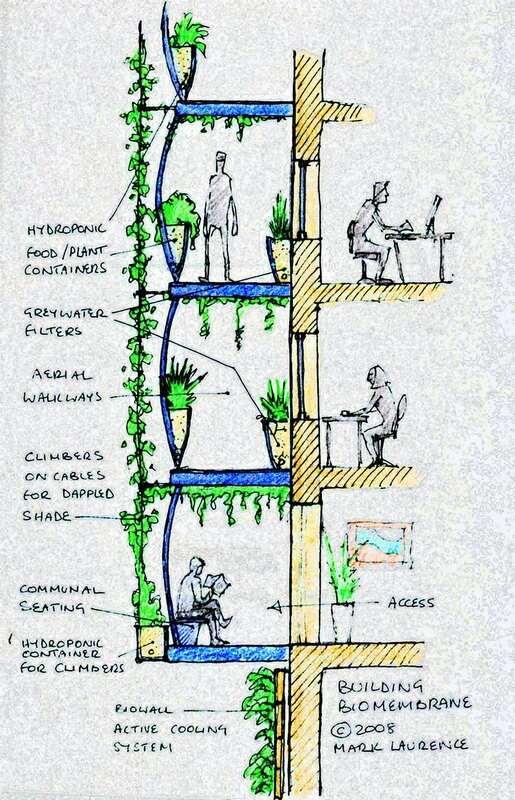 A selection of plants has been chosen which will adapt to the existing light levels, which are low on the face away from the windows. Feedback from staff and visitors has been incredibly positive! 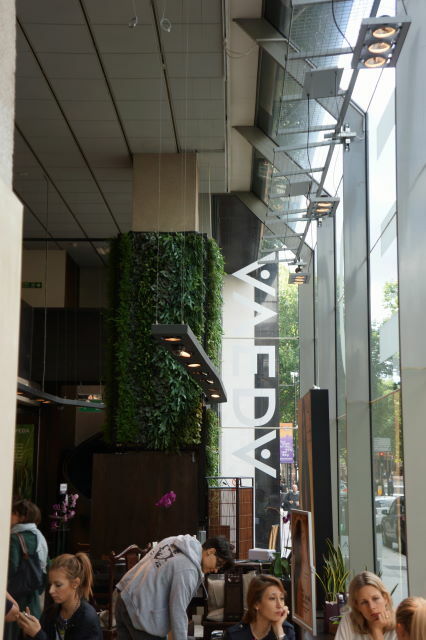 A second wall, also a column wrap, has been commissioned for Aveda at their outlet in Libertys, Regent Street. Note: final trim detail to be added at the time these pictures were taken. 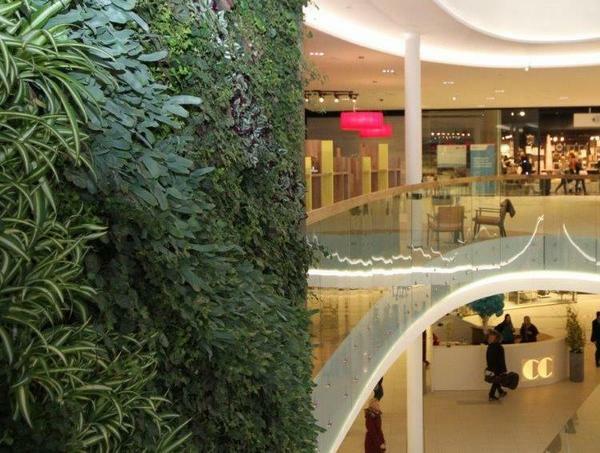 Reporters always have to grab a headline, so I shouldn’t have been surprised when the new green wall near Victoria station started grabbing headlines such as “London’s largest living wall prevents flooding”. It’s a misleading headline to say the least: A, it’s not the largest wall, that “accolade” (if size is all that counts) belongs to Patrick Blanc for his wall at Leamouth Peninsular, constructed by Biotecture in 2009 and B, it doesn’t prevent flooding. How could it? Striding about, with a big umbrella? 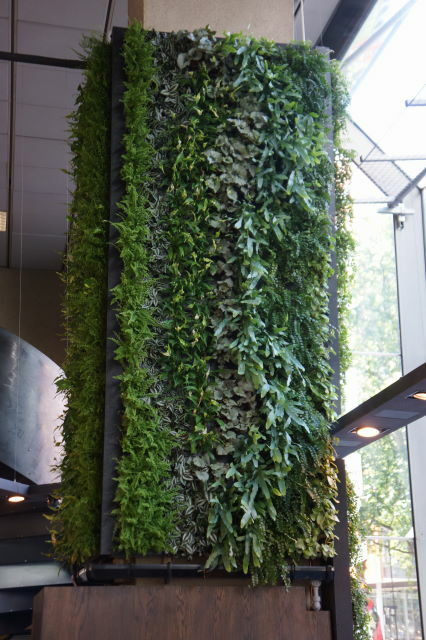 No, it has rainwater harvesting – as can any building, regardless of whether or not they have green walls (although they then have to have some use for it, such as flushing toilets), and that helps absorb water and delay rainfall from contributing to stormwater runoff. It may directly capture a small amount on the surface of the wall, but not much. 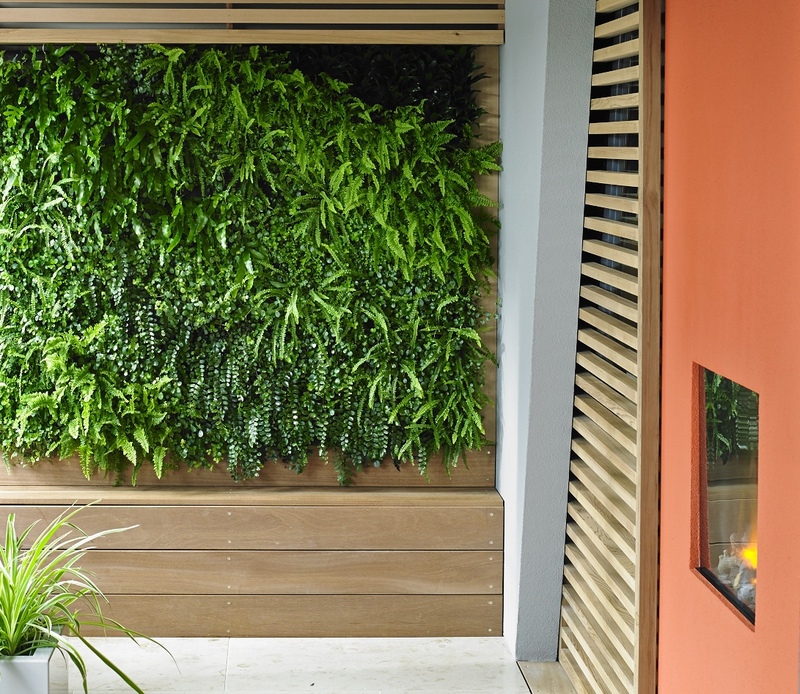 Now don’t get me wrong; this is a lovely green wall and most welcome. I know all the guys involved and they’re all genuine people. 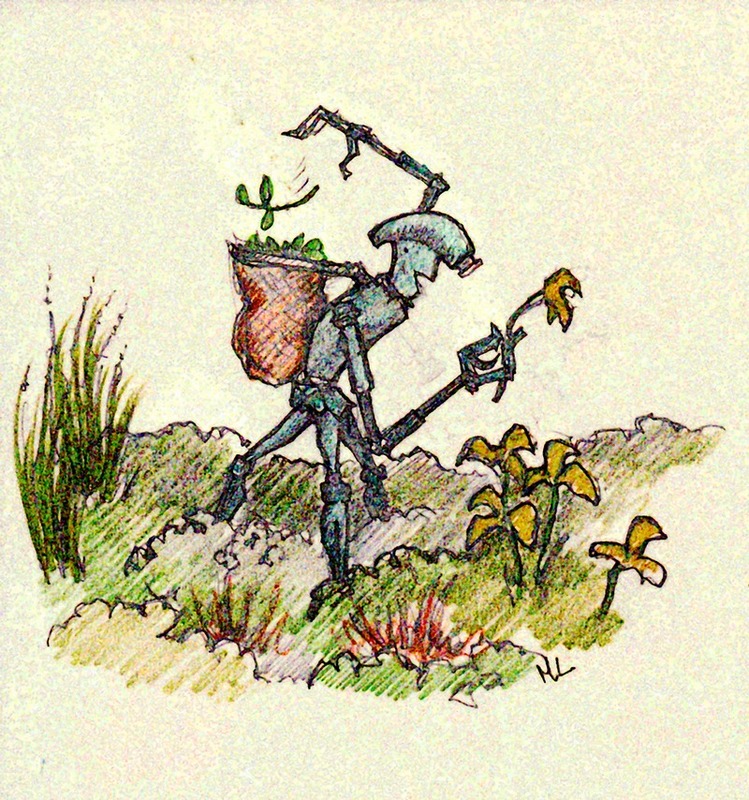 The wall will have many environmental benefits. No, what bothers me is the way the press grab shallow headlines that reduce the very real benefits to glib catchphrases, often completely divorced from meaningful context . 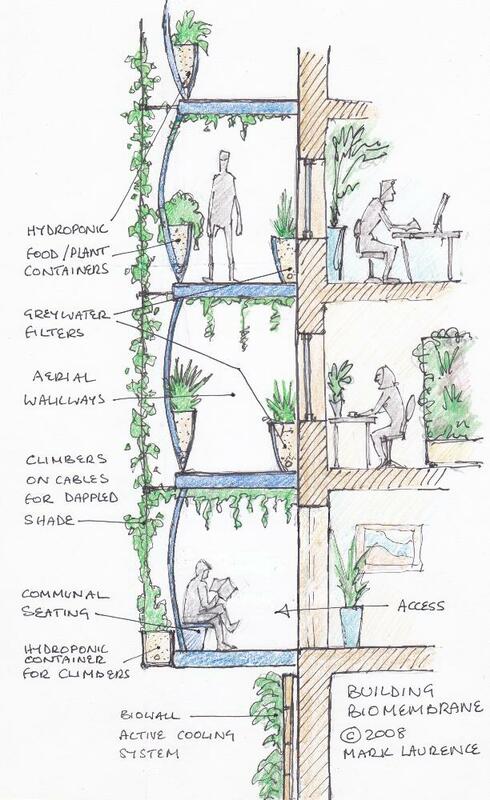 Of course rainwater harvesting reduces the risk of flooding, but one small scheme in a large area will have negligible benefit (just as the Edgware Road wall I designed for TfL will, on it’s own, have a negligible effect on air pollution); unless many buildings in that area follow suit and harvest rainwater, the impact will not be felt. 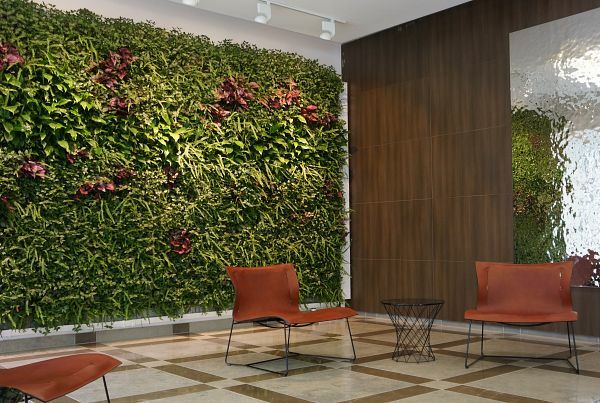 What walls such as this do, is pioneer and display the possibilities of what we may do and the potential outcome if we do enough of it. But the current attitude is, right, we’ve put up a green wall/green roof/planted trees, so job done, environment’s sorted… it’s just so NOT. Right now i’m frustrated by this attitude. For example, it seems that government, having done their bit (on air pollution, mentioned above), now have no monies in the “clean air fund” to take things to the next level; where we so urgently need to be going. 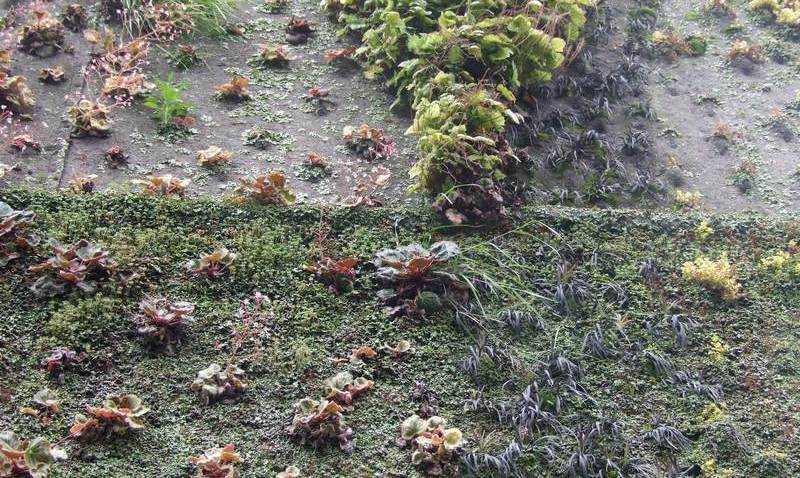 The simple reality is that a lot more testing is needed, more system trials; ways need to be found to effect a large-scale roll out of affordable greening (a major criticism is that the technology is too expensive). If the government won’t make funds available to do this, even in the face of massive EU fines for breaching air quality standards, then who will? 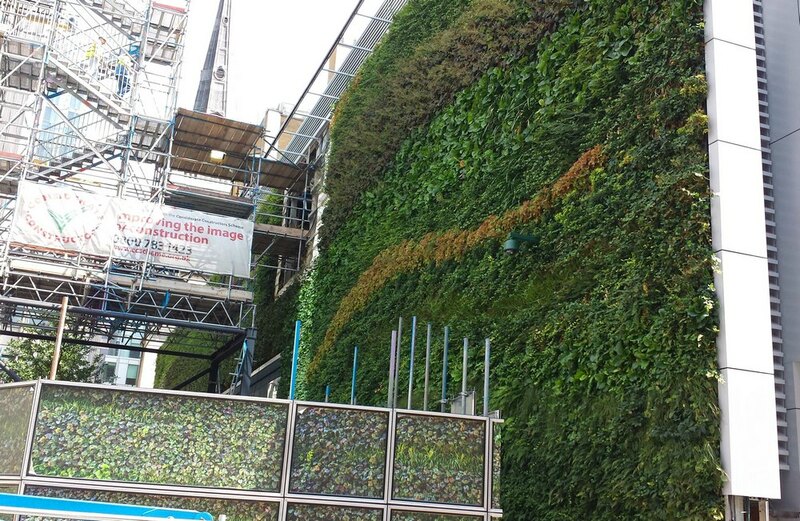 So the Edgware Road green wall becomes just another political chess piece, used then forgotten once it’s done it’s short-term bit of marketing. It’s time that as a society, we grew up, stopped living off of vacuous soundbites and got to grips with our environmental issues. One headline I got from a talk I gave last year, was “designer calls for environmental efforts to be put on a war footing”. Another bit of melodrama, but I did use the phrase, and meant it. Only with that level of serious intent and commitment can we get to make meaningful progress on adapting our societies to the incoming effects of now unstoppable climate change.